This entry is part 4 of 11 in the series Magento for PHP MVC Developers. 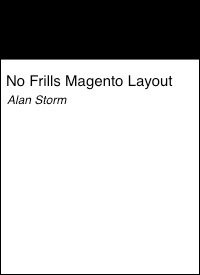 Earlier posts include The Magento Config, Magento Controller Dispatch and Hello World, and Layouts, Blocks and Templates. Later posts include Magento Setup Resources, Magento ORM: Entity Attribute Value; Part 1, Custom Magento System Configuration, In Depth Magento System Configuration, Varien Data Collections, Magento System Overrides and Upgradability, and Magento Default System Configuration Values. The implementation of a “Models Tier” is a huge part of any MVC framework. It represents the data of your application, and most applications are useless without data. Magento Models play an even bigger role, as they typically contain the “Business Logic” that’s often (right or wrong) relegated to the Controller or Helper methods in other PHP MVC frameworks. The following is part of a longer series about Magento aimed at developers familiar with PHP MVC development. While each article can be read stand alone, each article does build on concepts covered in previous articles. If you’re confused, be sure to catch up on the older stuff first. If the definition of MVC is somewhat fuzzy, the definition of a Model is even fuzzier. Prior to the wide adoption of the MVC pattern by PHP developers, data access was usually raw SQL statements and/or a SQL abstraction layer (such as AdoDB). Developers would write queries and not think too much about that objects they were modeling. In 2009 raw SQL is mostly frowned upon, but many PHP frameworks are still SQL centric. Models will be objects that provide some layer of abstraction, but behind the scenes developers are still writing SQL and/or calling SQL like abstraction methods to read and write-down their data. Other frameworks eschew SQL and take the Object Relational Mapping (ORM) approach. Here, a developer is dealing strictly with Objects. Properties are set, and when a save method is called on the Object, the data is automatically written to the database. Some ORMs will attempt to divine object properties from the database, others require the user to specify them in some way, (usually in an abstract data language such as YAML). One of the most famous and popular implementations of this approach is ActiveRecord. This definition of ORM should suffice for now, but like everything Computer Science these days, the strict definition of ORM has blurred over the years. It’s beyond the scope of this article to settle that dispute, but suffice it say I’m generalizing a bit and probably asking to be jumped by a couple of Java developers when I leave the house. It should be no surprise that Magento takes the ORM approach. While the Zend Framework SQL abstractions are available, most of your data access will be via the built in Magento Models, and Models you build yourself. It should also come as no surprise that Magento has a highly flexible, highly abstract, sometimes confusing concept of what a Model is. Most Magento Models can categorized in one of two way. There’s a basic, ActiveRecord-like/one-object-one-table Model, and there’s also an Entity Attribute Value (EAV) Model. There’s also Model Collections. Collections are PHP objects used to hold a number of individual Magento Model instances. The Varien team has implemented the PHP Standard Library interfaces of IteratorAggregate and Countable to allow each Model type to have it’s own collection type. If you’re not familiar with the PHP Standard Library, think of Model Collections as arrays that also have methods attached. Magento Models don’t contain any code for connecting to the database. Instead, each Model has two modelResouces, (one read, one write), that are used to communicate with the database server (via read and write adapter objects). By decoupling the logical Model and the code that talks to the database, it’s theoretically possible to write new resource classes for a different database platform while keeping your Models themselves untouched. You should be an old hat at creating empty modules at this point, so I’ll skip the details and assume you can create an empty module named Weblog. After you’ve done that, we’ll setup a route for an index Action Controller with an action named “testModel”. As always, the following examples assume a Package Name of “Alanstormdotcom”. at Alanstormdotcom/Weblog/controllers/IndexController.php. Clear your Magento cache and load the following URL to ensure everything’s been setup correctly. You should see the word “Setup” on a white background. Magento has a system for automatically creating and changing your database schemas, but for the time being we’ll just manually create a table for our Model. There are four individual things we need to setup for a Model in our config. The first part of the URI you pass into get Model is the Model Group Name. Because of the way Magento __autoloads classes, this also has to be the (lowercase) name of your module. The second part of the URI is the lowercase version of your Model name. So, let’s add the following XML to our module’s config.xml. The outer <weblog /> tag is your Group Name, which should match your module name. 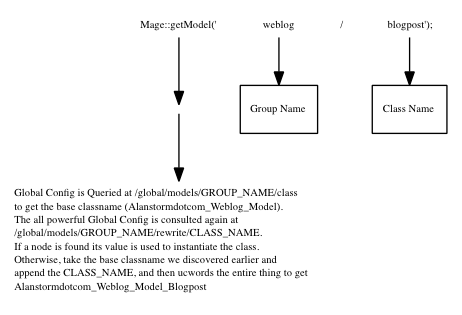 <class /> is the BASE name all Models in the weblog group will have. The <resourceModel /> tag indicates which Resource Model that weblog group Models should use. There’s more on this below, but for now be content to know it’s your Group Name, followed by a the literal string “mysql4”. and reload your page. You should see an exception that looks something like this (be sure you’ve turned on developer mode). Reload your page, and the exception should be replaced with the name of your class. All basic Models should extend the Mage_Core_Model_Abstract class. This abstract class forces you to implement a single method named _construct (NOTE: this is not PHP’s constructor __consutrct). This method should call the class’s _init method with the same identifying URI you’ll be using in the Mage::getModel method call. So, we’ve setup our Model. Next, we need to setup our Model Resource. Model Resources contain the code that actually talks to our database. In the last section, we included the following in our config. So, if you followed that all the way, what this means is, resource models are configured in the same section of the XML config as normal Models. This can be confusing to newcomers and old-hands alike. So, we’ve gotten things to the point where there’s no exception, but we’re still not reading from the database. What gives? Each Model group has a read adapter (for reading from the database) and a write adapter (for updating the database). Magento allows a Model to use the default adapter, or for developers to write their own. Either way, we need tell Magento about it. We’ll be adding a new tag section named <resources /> to the <global /> section of our module config. We’re adding two sub-sections to <resources />. One for writing, and one for reading. The tag names (<weblog_write /> and <weblog_read />) are based on the Group Name we defined above (“weblog”). Another exception! When we use the Model URI weblog/blogpost, we’re telling Magento we want the Model Group weblog, and the blogpost Entity. In the context of simple Models that extend Mage_Core_Model_Mysql4_Abstract, an entity corresponds to a table. In this case, the table named blog_post that we created above. Let’s add that entity to our XML config. We’ve added a new <entities /> section to the resource Model section of our config. This, in turn, has a section named after our entity (<blogpost />) that specifies the name of the database table we want to use for this Model. Eureka! We’ve managed to extract our data and, more importantly, completely configure a Magento Model. Magento Models store their data in a protected _data property. The Varian_Object class gives us several methods we can use to extract this data. You’ve already seen getData, which will return an array of key/value pairs. This method can also be passed a string key to get a specific field. There’s also a getOrigData method, which will return the Model data as it was when the object was initially populated, (working with the protected _origData method). The Varien_Object also implements some special methods via PHP’s magic __call method. You can get, set, unset, or check for the existence of any property using a method that begins with the word get, set, unset or has and is followed by the camel cased name of a property. That said, you’re likely to see both techniques used throughout the Magento code base, as well as third party extensions. It’s only the use of __get and __set that’s been deprecated. Magento implements all magic functionality in the __call method. Magento Models support the basic Create, Read, Update, and Delete functionality of CRUD with load, save, and delete methods. You’ve already seen the load method in action. When passed a single parameter, the load method will return a record whose id field (set in the Model’s resource) matches the passed in value. And finally, you can delete your post using very similar syntax. So, having a single Model is useful, but sometimes we want to grab list of Models. Rather than returning a simple array of Models, each Magento Model type has a unique collection object associated with it. These objects implement the PHP IteratorAggregate and Countable interfaces, which means they can be passed to the count function, and used in for each constructs. We’ll cover Collections in full in a later article, but for now let’s look at basic setup and usage. Add the following action method to your Controller, and load it in your browser. and you should see a (by now) familiar exception. You’re not surprised, are you? We need to add a PHP class file that defines our Blogpost collection. Every Model has a protected property named _resourceCollectionName that contains a URI that’s used to identify our collection. Just as with our other classes, we need to init our Collection with the Model URI. (weblog/blogpost). Rerun your Controller Action, and you should see your post information. Congratulations, you’ve created and configured you first Magento Model. In a later article we’ll take a look at Magento’s Entity Attribute Value Models (EAV), which expand on what we’ve learned here. Also, there’s a little fib we had to tell you earlier. In this article we indicated that all basic Magento Models inherit from Mage_Core_Model_Abstract. This isn’t 100% true. This Abstract method hasn’t existed for Magento’s entire life, and there are still many Models in the system that inherit directly from Varien_Object. While this shouldn’t affect any Models you create, it is something you’ll want to be aware of while working with Magento code.